Old Portsmouth was where Portsmouth started and it now houses many historic buildings. The above picture shows a view from the point looking down one of the narrow streets. Some of the places of interest are listed below. The guided bus tour takes in Old Portsmouth and the High Street on its tour. 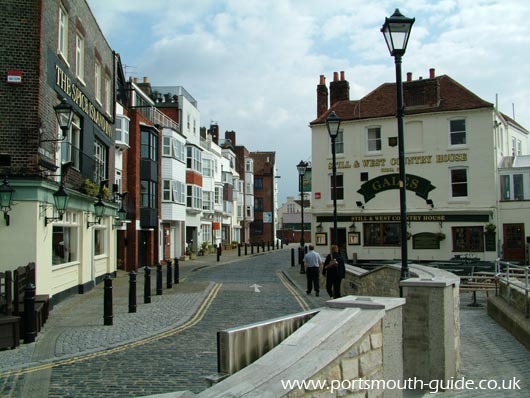 There are also guided walks around Old Portsmouth and the High Street run by Portsmouth City Council. Lets take a brief look at Old Portsmouth's history, In 1704 royal permission was given for people to build houses near to the dockyard and so a new suburb called Portsmouth Common grew, this changed its name to Portsea in 1792. This new suburb soon outgrew the original town, which became known as Old Portsmouth. The area called Old Portsmouth is located on the south western tip of the island. The area of Old Portsmouth is also known as Spice Island which is where all the spices used to enter the city. The area features many historical buildings and features. The old defences are still in place and you can walk along the hot walls, part of the fortifications for the harbour entrance. The area of Old Portsmouth is these days home to the fishermen of Portsmouth. The Spur Redoubt is the point where Nelson left Portsmouth to join Victory for the Battle Of Trafalgar in 1805. Admiral Lord Horatio Nelson would have left the George Hotel in the High Street by the back door to avoid the crowds that had gathered to bid him farewell and headed along Pembroke Road before cutting across Governors Green in front of the Garrison Church and going through the tunnel in the ramparts to join Victory. The hot walls are used by many people to wave goodbye to Naval personnel as they embark on a tour of duty or to welcome a ship back. King James’ Gate stood in Broad Street and was the entrance to the town. The gate would have had a huge stone arch and would have been manned by soldiers. There would have been a moat with a drawbridge that soldiers would have raised to closed off the part of the town known as spice island in the evenings. The gate is now the entrance to the United Services Recreation Ground.